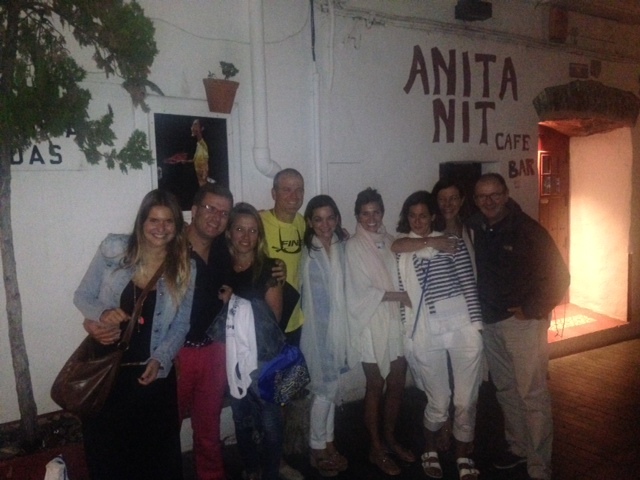 Casa Anita in Cadaqués– dinner of champions! Exactly a year ago today, I veered from blogging about goggles and cold water to a new subject–my battle against cancer. Hopefully this is the 10th and *last* post on this subject and I’ll move on. Last September, a kind doctor with veteran eyes told my rookie self: “You have stage 3 breast cancer.” I blinked and asked a mishmash of questions like: “Does that mean I have to cancel my favorite swim race in Spain in a couple of weeks? Wait, I’ll lose my hair?” The human mind is incredible. When told such unimaginable news, you knee jerk yourself to think about inconsequential things. That’s probably how we’ve survived all these years as a human race. From the minute you’re told you have cancer, you don’t want to share it. You want to hide it. You try to pretend it is not happening. You can’t sleep, wishing it goes away. When you start the treatment process, you sit next to someone so sick that you can’t comprehend how they’re functioning. Then you look in the mirror and you see that you look actually worse. It’s an uninhabitable universe. Dreaming about getting your life back to where it was before is futile. There’s no going back to a before. There’s a new now. On a daily basis, I grieve about what’s happened to me in a myriad of tiny ways- I don’t have full range of motion in my arms yet although swimming helps. I’m suffering from lymphedema in my arm which is painful. I still don’t recognize myself in the mirror with insanely short hair. I find myself suddenly and oddly shy in public. While I hear myself speaking about cancer in the past tense, I panic that a mosquito bite could be cancer rearing its terrifying head again. But I’m trying to make friends with these feelings. It’s the only way. Here’s the amazing thing about suffering–finding yourself connected with your family and friends on a deeper level than ever before. I have gratitude flowing through me for so, so many people, old friends and new, who helped me through this battle. For my children, who spent the last year with a walking billboard in their home advertising that things aren’t peachy all the time. For Mauricio who went to every doctor’s appointment, chemo and radiation with me without a single roll of his eyes at the sacrifice this must have taken on him. For my sisters who I’m pretty sure felt like this happened to them, and for my parents– I can’t imagine. Cancer strikes a family. I feel as if my friendships deepened and are as solid as granite. I feel gratitude for the tidal wave of help and support I received. I’m so grateful that I walk around today “cancer-free” thanks to modern medicine. I’m grateful that every day I feel stronger. I’m grateful for something so amazing about humans– we are resilient. 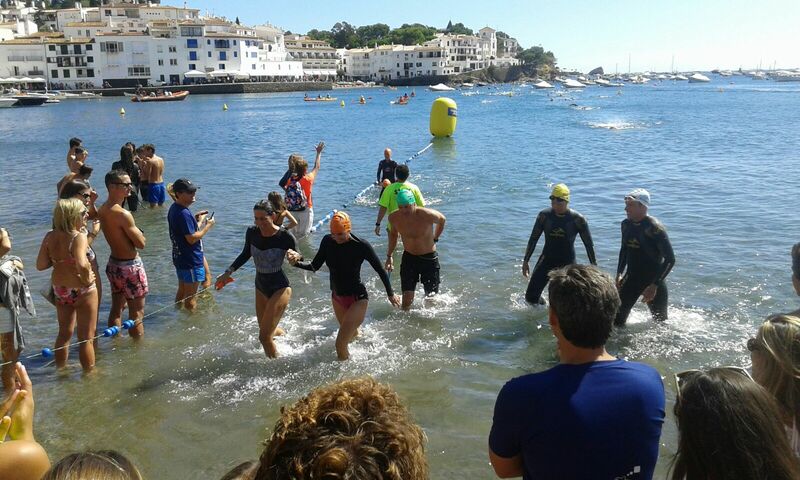 A year ago today as I was embarking on a horrible year, I canceled my trip to Spain to swim in my favorite open water swim- Marnaton Cadaqués. I wrote: “Next year I’ll be there for sure.” And thankfully, here I am. Tomorrow I’ll swim the 2K race– together with my dear friends. A new me– but swimming nonetheless! Ps–I honestly believe my amazing doctor at UCSF might be on the way to a cure. If you want to support, a little goes a long way! Crossing the finish line with the amazing support of Emily, Mauricio, Damian and Esther. Thank you! So happy for you Susan. I had lung cancer surgery at UCSF 3 years ago. I’m very grateful to my great doctors. CT-SCANS show no sign of cancer cells. Sandy and I have followed your posts. What a crap year it’s been. You exemplify resilience, Sooz. Thank you for sharing all your experiences. I had no idea, I haven’t read your blog in a while. It’s very inspiring that you were able to swim again this year. you are amazing Susan, that smile makes the sun look pale. Well done and as my wife says forza. I also think you may have the worlds best husband. What a team. I had chills reading your “last post”,but of joy.From where you were to where you are now is truly amazing.As you say the human body is amazing,and so are you!I look forward to seeing more photos of you doing what you love,and you never know,one day we might be able to train together again! Lots of love to you Susan!